The perfect side dish for your favorite meat entrée! Cook the brown rice according to package directions, adding the soup mix and omitting the salt. Melt the butter in a small saucepan; add the mushrooms, walnuts and parsley. Saute until bubbly. 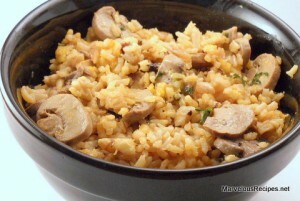 Stir the mushroom mixture into the rice; add the cheese and mix well. Let stand, covered, 5 minutes before serving. Makes 6 servings.